The Fourth of July is a three-day-event here in Livingston, although this year things kicked off a day early with the unbelievably great concert called “A Song Runs Through It”. It was worth the three hours in the blazing sun to see my beloved Rosanne Cash sing four songs off Black Cadillac“, acoustic, backed up by her friends JD Souther, Victoria Shaw (who was *so* much fun) and Jim Photoglo, friends she then backed up on a selection of their songs. I really love listening to these songwriters talk about their work — there was a lot of talk about songs they loved that never got on the radio, songs that did get on the radio, who sung which song which way as opposed to another version. It was terrific, and then Rodney Crowell brought down the house at the end with his band The Outsiders. My beloved stepmother rode out from Seattle on her motorcycle and arrived just in time for the concert on Sunday. 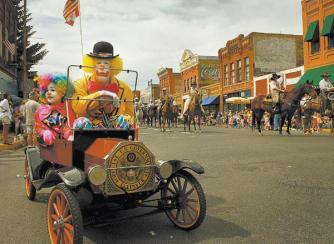 Monday brought the famous Livingston parade, followed by a night at the rodeo. We’ve got a great rodeo here in Livingston — part of the “Cowboy Christmas” circuit — this year was pretty uneventful — one of the local girls who carries the flag during the opening took a bad fall in the out gate, but I hear she was back out there the next night, riding with the rest of them. Tuesday we spent on the river — our sweet friend Jen took us out — Susan and Jen shared a two man “ducky” while I had a little flat-bottomed play kayak — it was so much fun. I spent a few years in my early twenties working as a raft guide and learning to paddle whitewater canoes and kayaks, and while I’m grateful for the experience, and glad I know how to read water, I’m so over anything that difficult. We floated. We had a good time. We were never in the slightest danger of flipping over or getting in trouble. It was delightful. Then we had some dinner and caught a phenomenal show by Tracy Nelson outside at the Pine Creek Cafe — she was unbelievably great. And then yesterday the MH took my stepmother fishing — he is a fishing guide, after all, and we went down for a little soak in the afternoon at Chico Hot Springs before the MH came over and cooked us a gorgeous dinner of doves and hungarian partridge on the grill, accompanied by morel risotto garnished with the first peas from my garden and a huge salad with the first lovely lettuces and arugula and green onions of the season. It was a lovely weekend, and now I’m exhausted. It’s going to be 100 degrees today and I think I’m heading to the cool of the downstairs office to try to get the second section of my book off the ground. It was a perfect week off — four days of company followed by four days to myself to putter, read, and get some writing done.